Lower back pain is one of the most common reasons people go to the doctor or miss work and a leading cause of disability worldwide. Most people have back pain at least once. In many cases, lower back pain gradually improves with home treatment and self-care, usually within two weeks. Typically, back pain or lower back pain can develop after a fall, heavy lifting, or lifting or loading the spine while twisting, or after sudden awkward movements. Muscle fatigue, high speeds or poor lifting postures are also common causes. Inefficient back muscles can lead to poor joint stabilisation and subsequent injury creating an accumulated micro-trauma that overloads your lower back structures over an extended period of time to cause injury and back pain. sustained over-stress injuries e.g. from repetitive heavy lifting. In these cases, normally positional stress creates an accumulated micro- trauma that overloads the lower back structures over an extended period of time to cause injury and back pain. A lot of lower back pain is musculoskeletal in origin and is known as non-specific low back pain. Most commonly, these back injuries are caused by muscular strains, spinal ligament sprains and joint dysfunction. Ligaments are the strong fibrous bands that limit the amount of movement at available at each spinal level. Stretching ligaments too far or too quickly will tear them with subsequent bleeding into the surrounding tissues, causing swelling and pain. Awkward lifting, sports injuries and motor vehicle accidents are very common causes. Discs act as cushions between the bones (vertebrae) in your spine. The soft material inside a disc can bulge or rupture and press on a nerve. Spinal discs are the shock-absorbing while allowing movement at each spinal level, and enough room for the major spinal nerves to exit from the spinal canal and travel to your limbs. A disc bulge, commonly referred to as slipped disc or herniated disc, can potentially press against or irritate the nerve where it exits from the spine. This nerve pinch can cause back pain, spasms, cramping, numbness, pins and needles, or pain into your legs. Repeated micro-trauma over an extended period can lead to disc injury. Over time, this leads to poor disc integrity and displacement of the disc nucleus fluid posteriorly. e.g.in a motor vehicle accident. This may happen due to the nature of the sudden forces exerted through your body at the time of impact and your bodies attempt to repel those forces resulting in tearing of the annulus fibres and hence a disc injury. 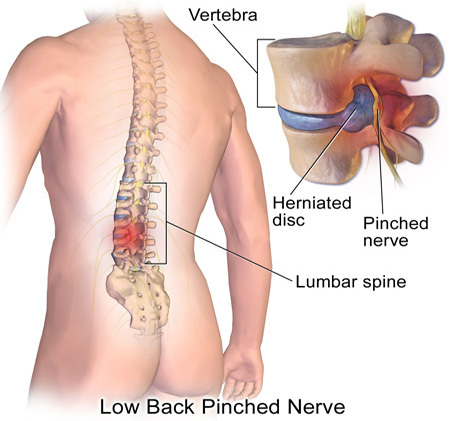 Note, bulging or ruptured discs can occur without back pain. Disc disease or degeneration is often an incidental finding on imaging conducted for other reasons. Sciatica or leg pain with or without, pins and needles, numbness or weakness may be associated with more severe disc pathologies. Sciatica describes pain in the leg felt along the course of the sciatic nerv e, which runs from your lower back, down through the buttock, hamstrings and into the lower leg. The sciatic nerve is the longest nerve in the body. The spinal sections it originates from include L4, L5 or S1. 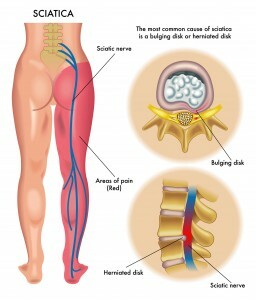 Pressure on or irritation of the sciatic nerve from a herniated disc and surrounding inflammation, muscle spasm and related muscle and ligament micro-trauma usually causes sciatica. 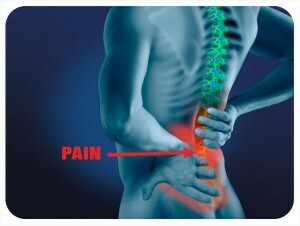 In addition, inflammation from soft tissue damage around the joints of the spine, and also compression of the nerve from bony arthritic growths can commonly cause sciatica. Traditional treatment of low back pain usually involves the use of pain relieving medication or analgesia. Medication such as paracetamol, non-steroidal anti-inflammatories, or stronger opioid analgesia are often prescribed. Muscle relaxant medication may also be prescribed. Analgesia is used to reduce pain and suffering but doe not influence the active healing or recovery phase. Such medications can also do more harm than good and recent evidence indicates their benefits are very limited. It is recommended to rest from aggravating activities or movements yet remain mobile. One cannot exercise away acute or chronic low back pain. In fact, stretching and loading exercises can often exacerbate chronic low back pain and should be avoided. Neither can inflamed and damaged tissues of the spine and support structures be massaged into repair. Massaging damaged and inflamed soft tissues can often further irritate and aggravate tissue injury, or at best achieve little when the damage is several centimetres deep and beyond the reach of the massaging hand, or topical anti-inflammatory agents which just don’t reach their target. Such injuries best recover and heal if allowed to rest from loading and excessive movement and deep tissue massage techniques. Cold packs are not useful to treat inflammation associated with low back pain and sciatica as it only serves to cool the skin and superficial tissues. It feels unpleasant and actually reduces important blood flow carrying oxygen and nutrients to the injured area and reduces the removal of waste products of the inflammatory process. In contrast, warmth improves blood flow to and from the injured tissues and helps muscle relaxation as well as providing comfort and natural analgesia. both of which trigger an inappropriate over-zealous immune inflammatory response further adding to the burden of pain, muscle spasm and swelling of the lower back structures. By improving circulation and increasing cellular repair functions LLLT provides an environment for your body’s own natural healing processes to be activated and restored. Once normal immune processes are restored, the excessive inflammation is reduced and healing can begin. LLLT does not exert any physical force on the soft or hard tissues of the back and spine. Manipulation of the back just aggravates it, so you don’t want to actually handle the tissues, but instead LLLT decreases the inflammation enabling faster healing. LLLT stimulates blood flow and lymphatic drainage, improved delivery of O2 and nutrition to the area, oxygen utilisation, removal of oxygen-free radicals and other waste products, and tissue healing. Read more on how Low Level Laser Therapy works. The end result is resolution of inflammation and restoration of healthy soft tissues. Once tissues are healed, pain is eliminated and normal range of motion and function is improved. Then muscle and tendon strength and flexibility can be addressed with graduated exercises and stretching. LLLT has no known side effects, is safe and effective. By treating the underlying problem, LLLT results in relief of pain and restoration of function. As pain improves, we will give you exercises that can increase your flexibility, strengthen your back and abdominal muscles, and improve your posture. Regular use of these techniques can help prevent pain from returning. Regular low-impact aerobic activities — those that don’t strain or jolt your back — can increase strength and endurance in your back and allow your muscles to function better. Walking and swimming are good choices.